With an eye for feminine timekeeping styles, the watches of Michele are an extremely popular choice amongst modern-day fashionistas and contemporary tastemakers. Since 1940, Michele watches have been the go-to choice for ladies looking for a timepiece that is as beautiful as it is functional, precise, and simple to wear with an assortment of ensembles. 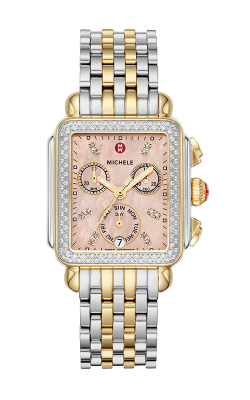 Available now at authorized retailers are Michele timepieces in an array of models that include brilliant shining diamonds, accurate internal movements, as well as that feature genuine gold and long-lasting stainless steel cases. An exceptional fine fashion jewelry accessory for women of all ages and tastes, Corinne Jewelers is honored to offer a wide selection of Michele watches in their Toms River showroom today! Honored to be a part of this legacy of horological excellence, the friendly staff of Corinne Jewelers is proud to bring their Ocean and Monmouth County customers an amazing handpicked inventory of women’s watches from Michele. Perfect for women searching for a Michele timepiece of chic style and cutting-edge precision, the watches of the Sidney collections are sure to please. Built of gleaming precious metals and featuring state-of-the-art chronograph complications, these Michele watches are as helpful as they are beautiful. Further, from the Michele Serein and Serein Mid lines are watches made with confident circle-shaped faces, as well as round shaped diamonds placed directly into the watches’ stainless steel bezel. Also available today at Corinne Jewelers, are the ladies’ timepieces of the Cape collection by Michele. Additionally, the watches comprising Michele’s signature Deco collection – including those from the Deco Mid and Deco Madison lines – are truly impressive pieces of classic timepiece sophistication. Finally, the watches of the Michele Hybrid Smartwatch collection are programmed to help with alerts, reminders, and more simple functions. Why Shop with Corinne Jewelers? Proud to be “The Diamond Source” in the greater Toms River, New Jersey area, Corinne Jewelers is the place to find an amazing selection of designer-made bridal jewelry, fashion jewelry, and authentic loose diamond stones. In addition to the women’s timepieces of Michele, Corinne Jewelers is also an authorized retailer of watches from Citizen, engagement rings by Hearts on Fire and Gabriel New York, as well as fine jewelry pieces by Madison L, Fana, Simon G, and many more. Further, to ensure a lifetime of satisfaction in every purchase, Corinne Jewelers also offers on-site jewelry repair, gold buying, and comprehensive custom jewelry designer services.